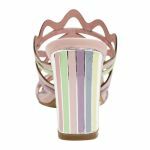 Have you ever seen a summer heel look so sweet? NEEDHAM by Django & Juliette is the perfect mule for those bright summer days. 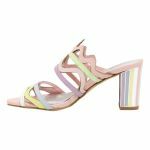 The soft multi coloured pastel leather stands out from the crowd and will add a bit of fun to any outfit! These mules are easy to walk in as the leather straps grip to your feet and the padding in the insole makes sure that every step is a comfortable one!